As Andrew mentioned in his February 24 blog post on walking in two worlds, “there is the world of contemporary time and place defined by the mainstream culture, and there is the world of indigenous culture, knowledge and understanding.” In addition to the individual experience, the two worlds intersect in the realm of new tools and technologies. Integrating the best of both worlds is best reflected in two trends on the reservations: renewable energy and sustainable housing. And, in keeping with Native cultures, it is no surprise that both of these are green trends that respect the natural environment. No stranger to green housing, the traditional Navajo Hogan in use for centuries is considered energy-efficient housing. Comprised of a wood structure with mud packed against it, a Hogan is cooled by natural air ventilation and water sprinkled on the dirt floor or heated via a fire pit (or stove today). The dense mass of the Hogan creates an ability to store heat and level out temperate fluctuations. Under our NRF home repair service, the Elders’ homes we repair are often contemporary hogans. Today, sustainable straw bale homes are also being built on the reservations. 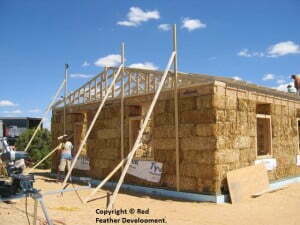 Red Feather Development builds straw bale houses in Native American communities throughout Montana, North Dakota and South Dakota, as part of the American Indian Sustainable Housing Initiative. NRC Program Partners have also shared about the straw bale homes on the Hopi Reservation. With 90,000 Native American families homeless, straw bale homes are a significant and accessible means of housing. They are affordable, go up quickly, are environmentally friendly and made from natural materials that are locally available in remote communities. Some straw bale houses also incorporate solar panels to support hot water and floor heating, and systems to catch rainwater – a key factor for reservation communities with contaminated ground water. Native Americans have also for centuries lived in harmony with the natural environment. If your land has rivers, you fish. If your land has pastures, your herd cattle or sheep or buffalo. So the current focus by tribes on renewable energy makes perfect sense – it’s a blend of new technologies meeting modern needs while protecting the environment and seven generations into the future. 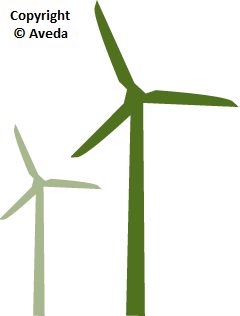 Renewable energy also bodes well for future economic development of the tribes. NRC offers the AIRC winter fuel service because running out of energy assistance budget mid-winter is an annual challenge for some of the reservations. Now, on the Fort Berthold and Rosebud reservations in North Dakota and South Dakota, massive wind turbine projects are underway. These will provide key learning about the effectiveness of wind energy and possibly lead to a commercial scale of wind energy production. The Oneida Reservation in Wisconsin has a solar project to provide renewable energy for electricity and hot water needs, and the Manzanita Reservation in California has a hybrid wind-and-solar project in the works. These and the off-grid project by Laguna Pueblo in New Mexico are just a few of the leading edge renewable energy projects being led by the tribes today. To me, the green trends on the reservation are a natural outgrowth of the way of life honored by Native Americans for centuries. At the same time, the lead that the tribes are taking in clean energy and sustainable housing is both hopeful and impressive. As always, there is much to learn from inherent Native wisdom. This entry was posted in Humanitarian and tagged American Indian, clean energy, hogan, Hopi, Laguna Peublo, Native American, renewable energy, Rosebud, Seventh Generation, straw bale house, sustainable housing. Bookmark the permalink. Trackbacks are closed, but you can post a comment.